Homeshield's product quality combined with the quality control of its installations mean that its high build wall coatings come with a 15 year guarantee covering both materials and labour (most painting contractors only offer a 1 to 2 year guarantee). 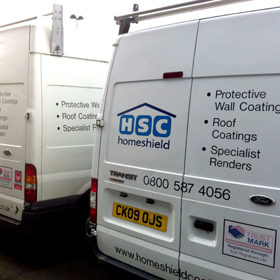 If you have a problem which is covered by your Homeshield Guarantee with either your Wall or Roof Coating we will resolve the problem FREE OF CHARGE at anytime during your guarantee period. For further peace of mind Homeshield wall coating guarantees comes with a FREE Insurance Backed Guarantee from QA National Warranties underwritten by Guarantee Protection Insurance Ltd Registered in UK number 03326800, a UK Based, FCA compliant Underwriter. This insurance backed guarantee covers any deposit, work-in-progress and any subsequent loss of guarantee benefit should Homeshield cease to trade. The vast majority of other wall coating contractors charge extra for such policies and/or supply policies underwritten by a non-UK based underwriter and hence do not fall under the FCA (UK Financial Conduct Authority) rules and regulations for underwriters concerning "treating customers fairly" and tests regarding their financial strength. Homeshield is able to provide such policies not only free of charge but from a UK regulated insurer because it submits itself to an onerous and regular audit scheme (well over and above that required for its Trustmark membership). The process involves office, administration and most importantly various site audits of both completed and on-going jobs by a Chartered Building Surveyor. Furthermore this process is not a 'one-off' and the company is subject to regular on-going audits which is a far higher level of audit than required for mere Trustmark approval.